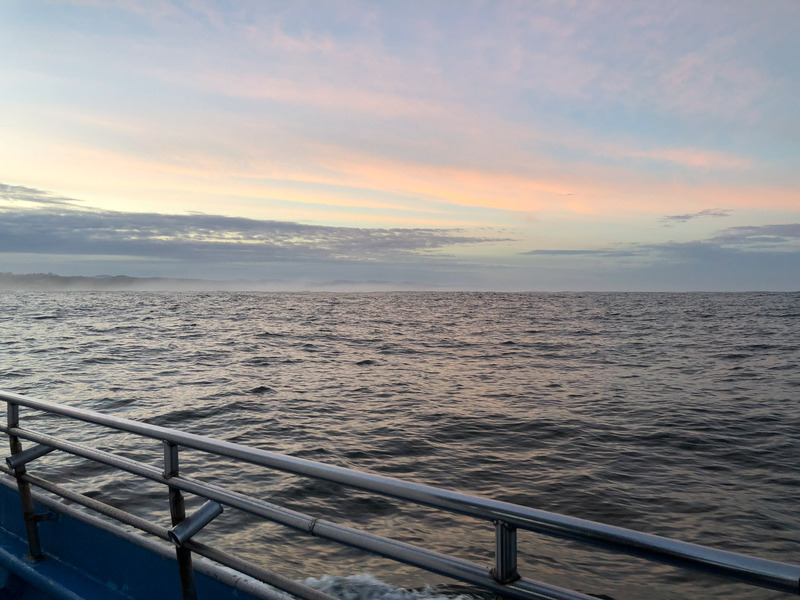 My five hour pelagic trip at the Oregon Shorebird Festival went so well I thought I’d test my system on an 8-hour late fall trip out of Newport last weekend. 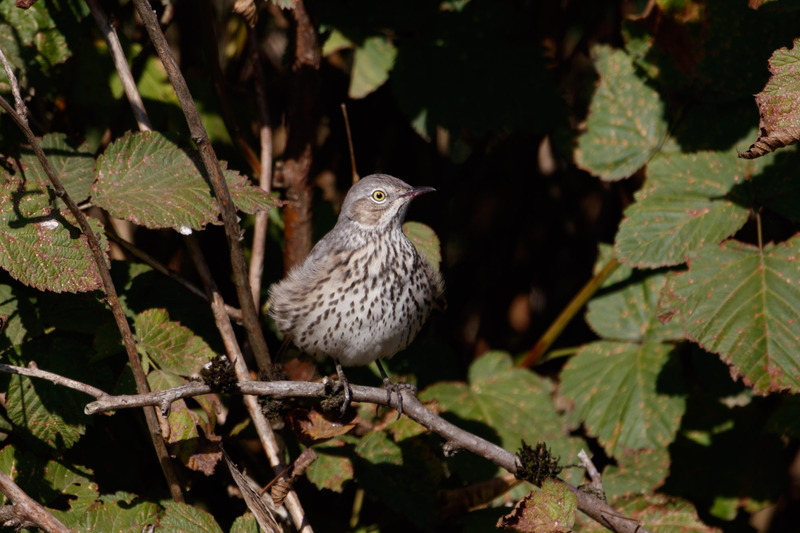 It was a good opportunity to pad my Oregon year list to try and get to 300 species. I left work early Friday to make way for the coast. 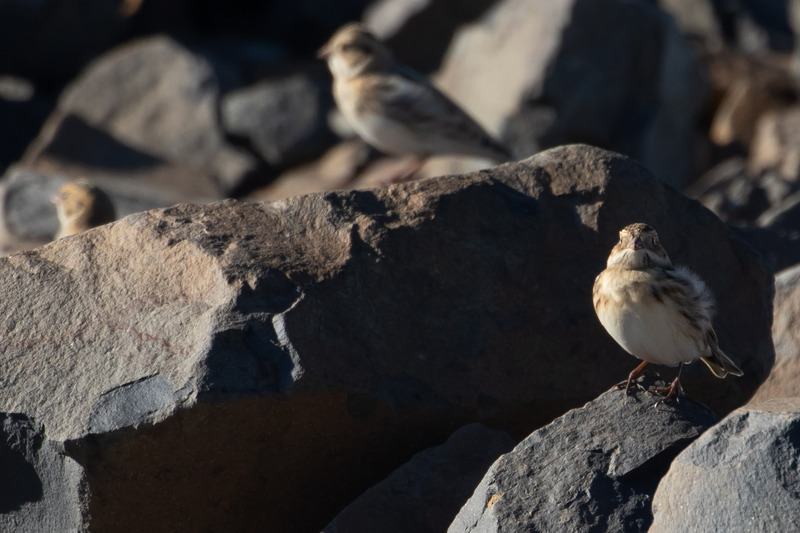 But first I made a stop at Mary’s Peak near Corvallis to look for a reported Snow Bunting. I had a lot of doubts going in that it would still be there. And even if it was would I be able to see it through the thick fog? 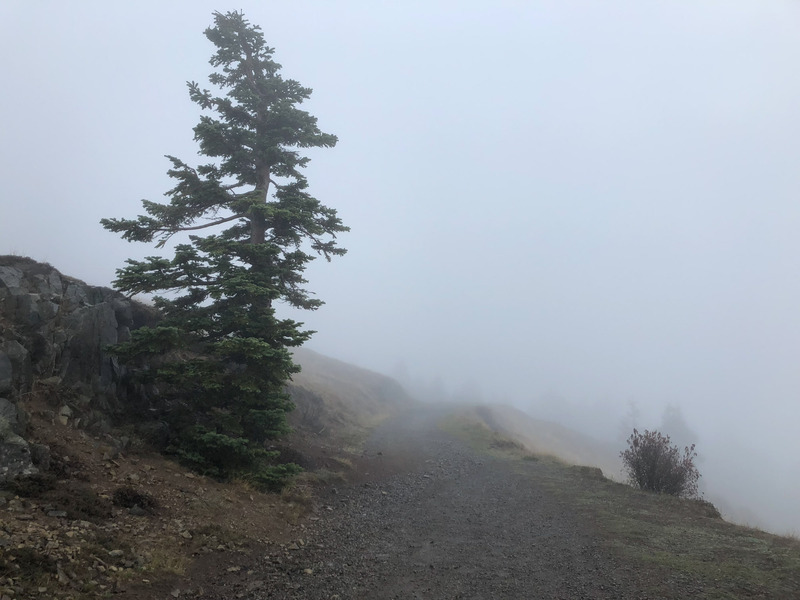 I parked and walked the half mile to the summit along a service road. It was pretty easy walking lucky for me and my ankle. Almost to the top I saw a man and his daughter on their return trip, the man asked if I was a birder and told me “it’s still here, right next to the picnic tables.” Hooray! Indeed it was! I almost tripped over the thing. In the misty rain and fog it blended right in with the gravel road. I laid down in the grass and hung out with my life bird (#492). Totally worth the detour! I got to Newport, settled in, and before long it was the next morning and time to board the boat. The weather forecast was not good. There was a “hazardous seas” alert until 3am the morning of, and 8-9ft swells predicted for the day. A bad weather forecast does nothing to help anxiety. But lucky for us, the day started out calmer than predicted and we even had some sun! Since there were no processing ships to chase our captain picked an azimuth and kept on going. 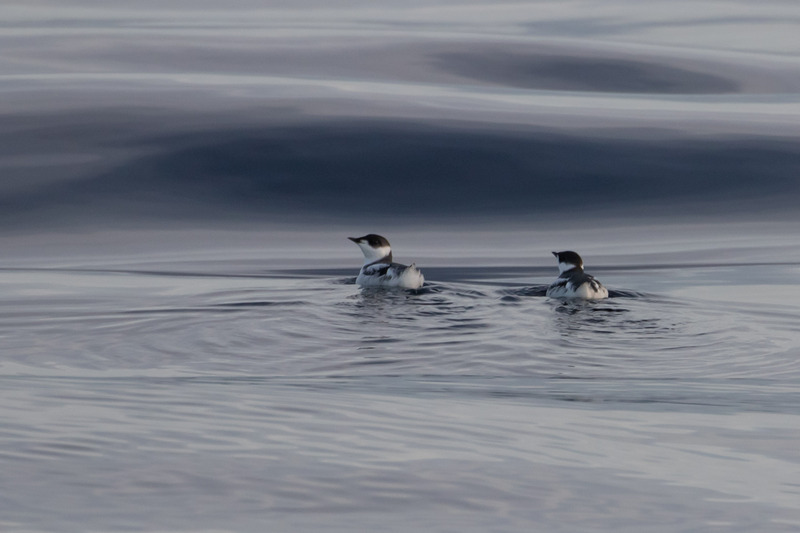 About five miles out we spotted a pair of Marbled Murrelets. 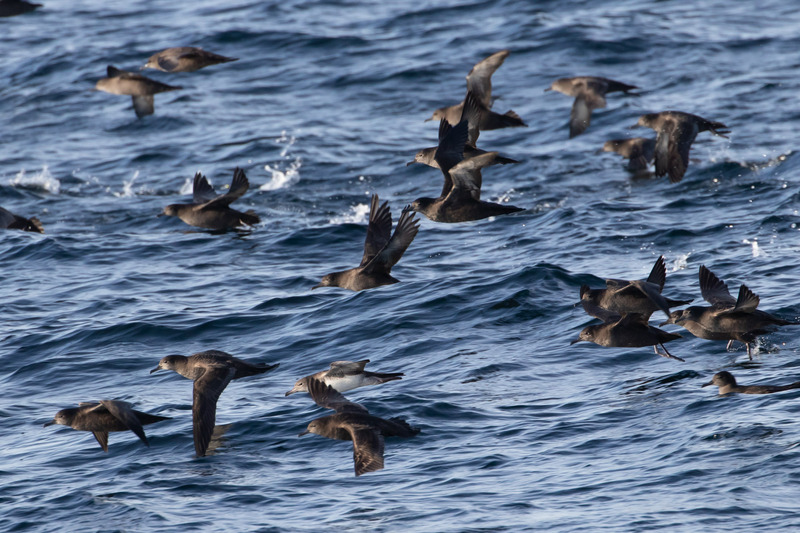 Not long after we found a group of feeding birds including mostly Sooty Shearwater. 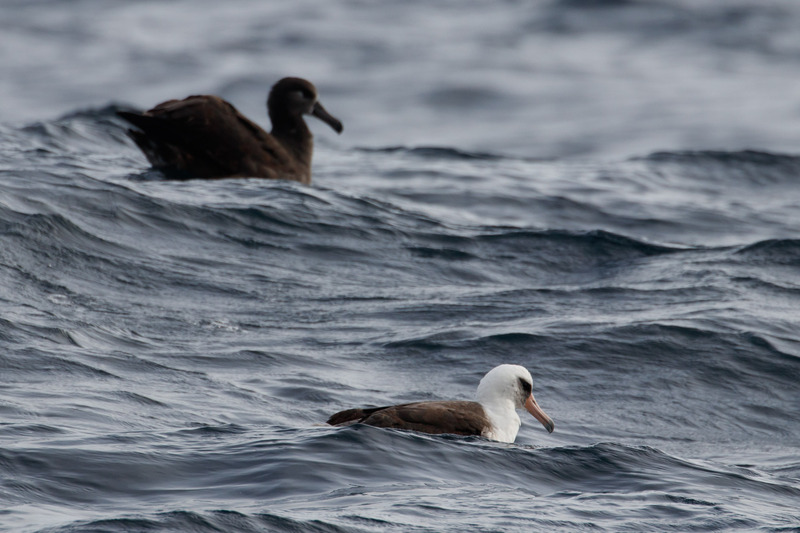 With a Pink-footed Shearwater in the mix. 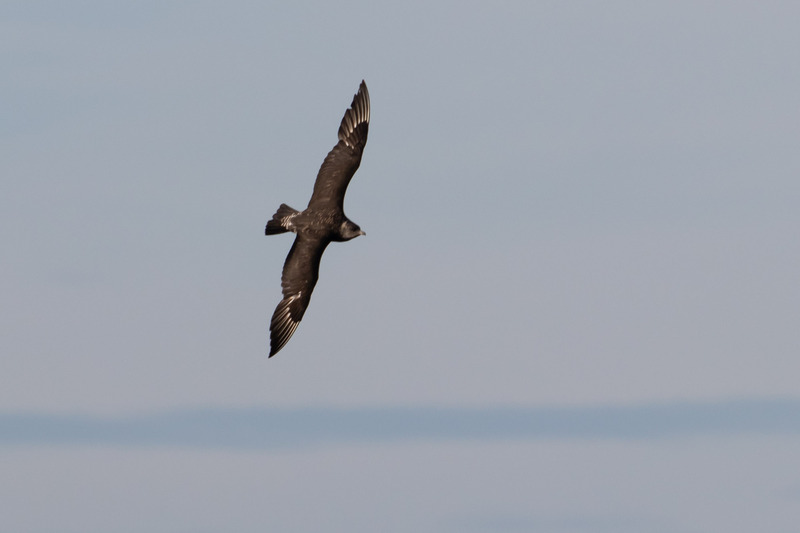 This was also where we saw one of our only jaegers of the trip, a Pomarine Jaeger that surprisingly didn’t stay long. 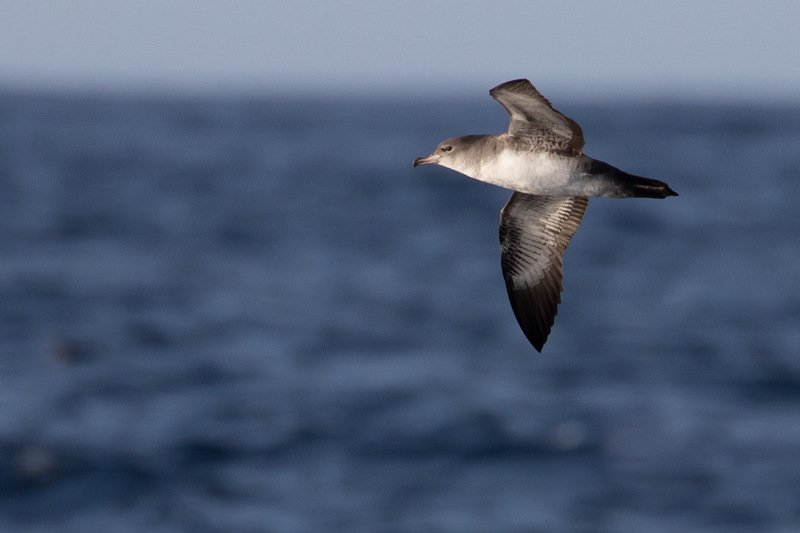 Shortly after we had a Buller’s Shearwater that was one passenger’s 1000th life bird! 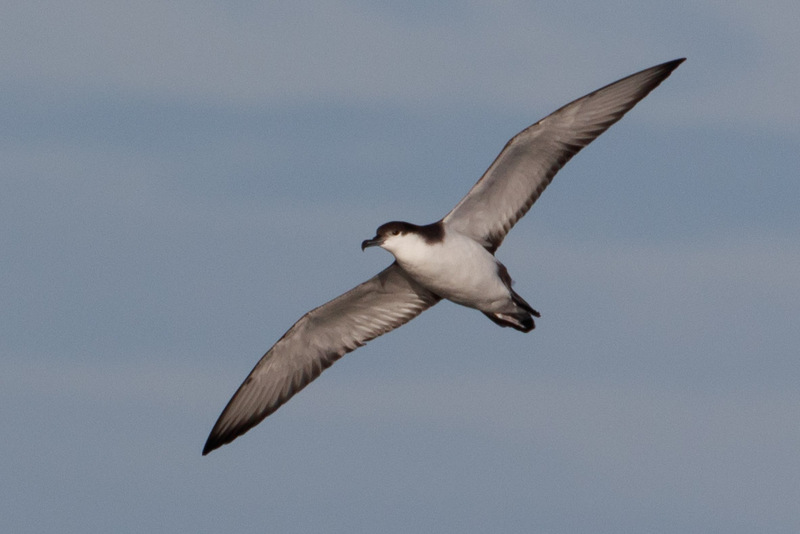 I’d boarded the boat at 297 Oregon year birds and hoped for Laysan Albatross, Black-legged Kittiwake, or any kind of storm petrel. 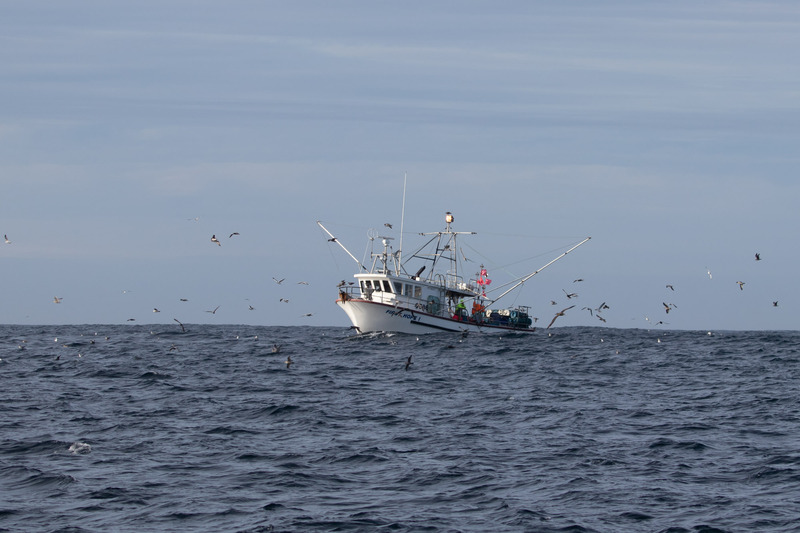 Eventually we came across a small fishing vessel, catching slime eels (or Hagfish). Birds aren’t picky, they were there too. 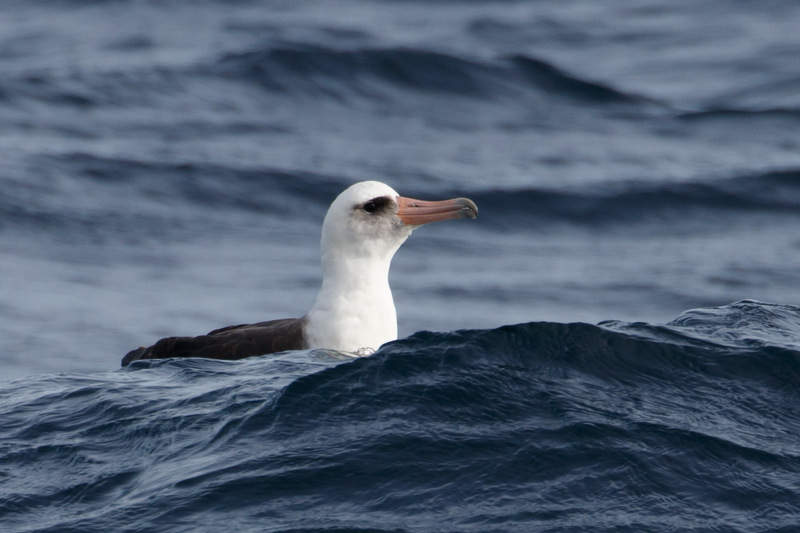 Our guide Tim (and a few unwell passengers) chummed the waters here and the birds came on over including a Laysan Albatross! #298! This was a good chum stop. 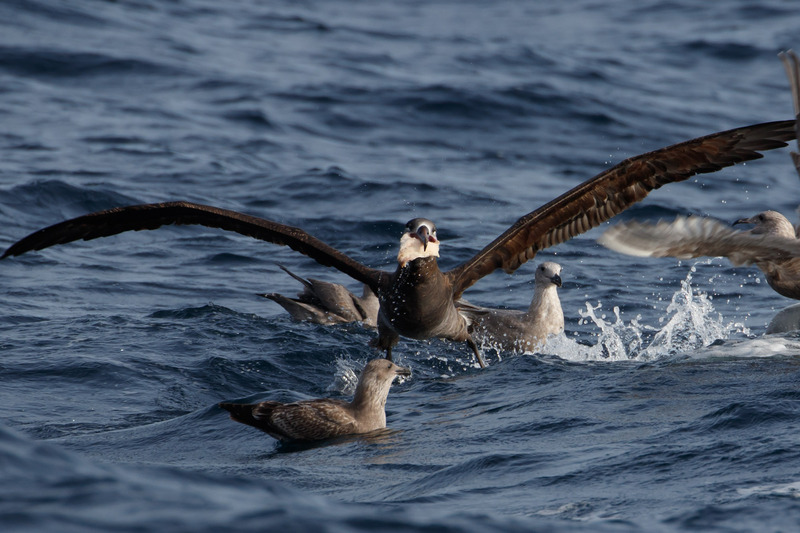 The Laysan Albatross floated close to the boat, next to black-footed. Rumor is there is a (new? re-established?) 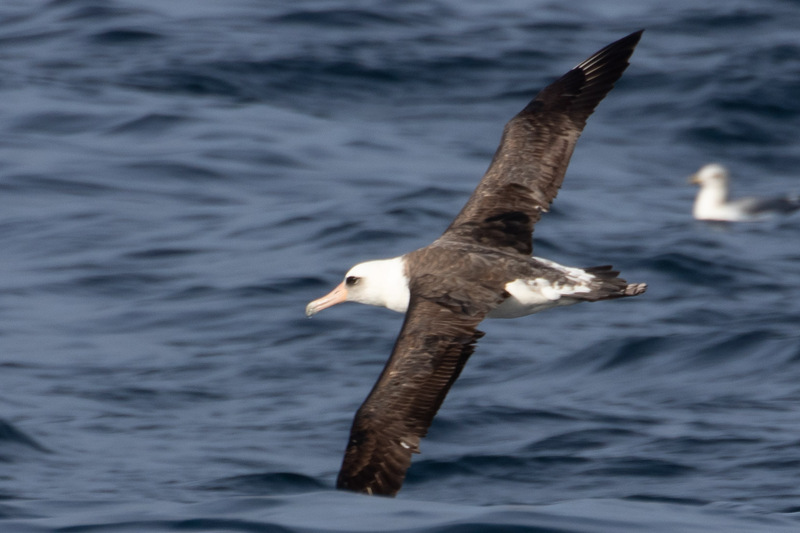 Laysan Albatross breeding colony in Mexico, so (though still not common), more individuals are being seen on Oregon pelagics, not just the LAAL from the Hawaii colony. 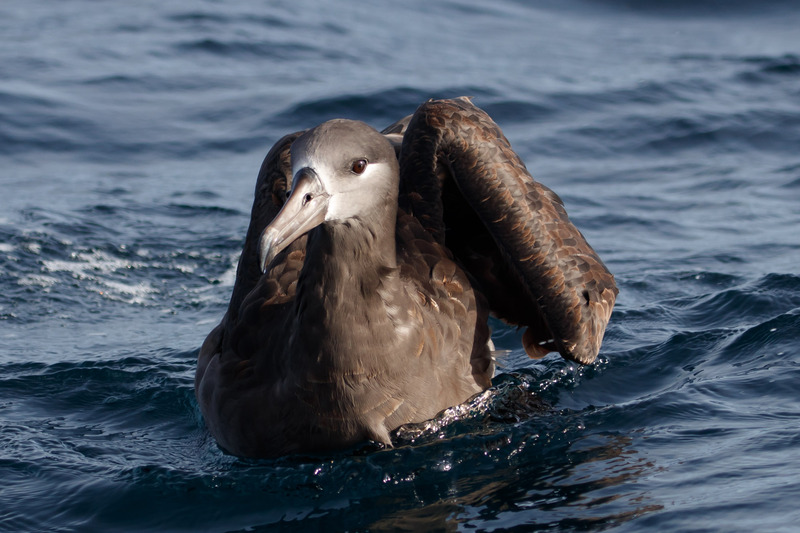 This is good news for albatross and for Oregon birders. About this time the weather turned dark and the boat turned around. I took another Bonine pill and kept my calm. 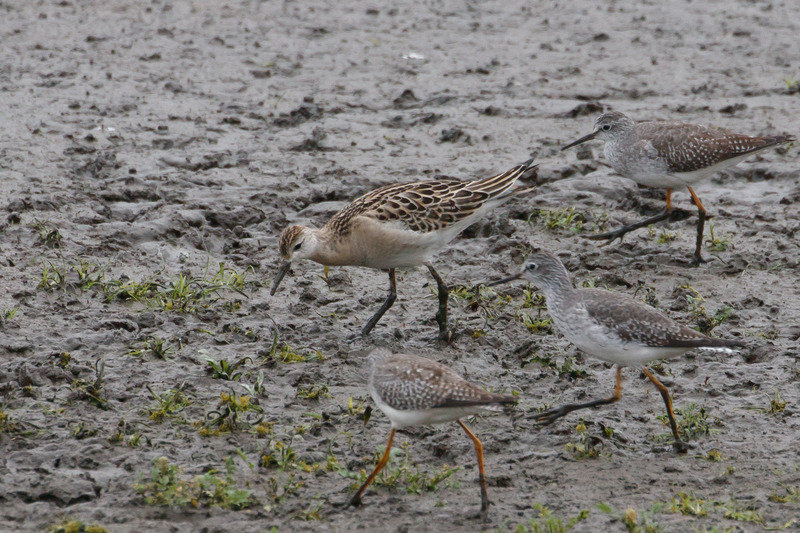 A third of the way back the captain spotted a group of birds and moved us closer to inspect. 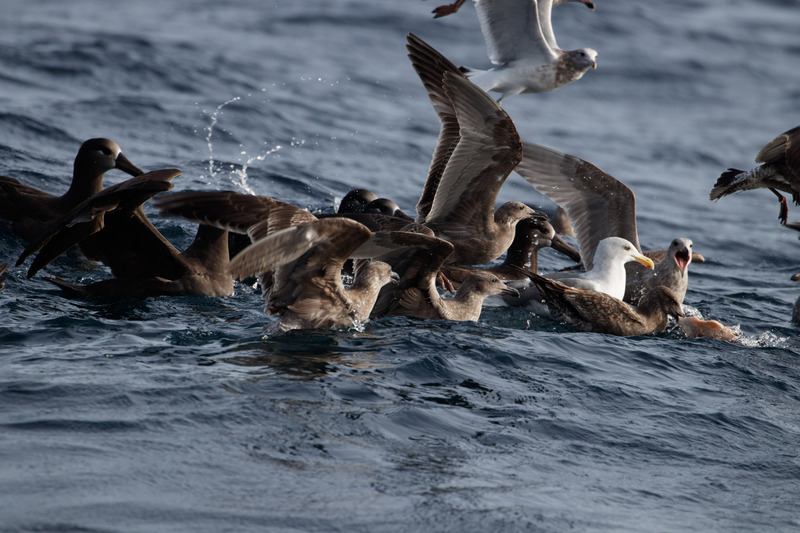 Someone yelled Black-legged Kittiwake! Yes! #299! How lucky am I? Pretty damn lucky. 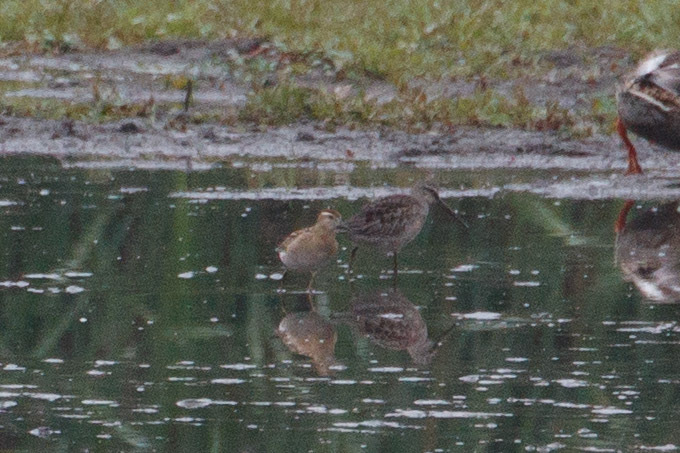 There were at least two juvenile birds. 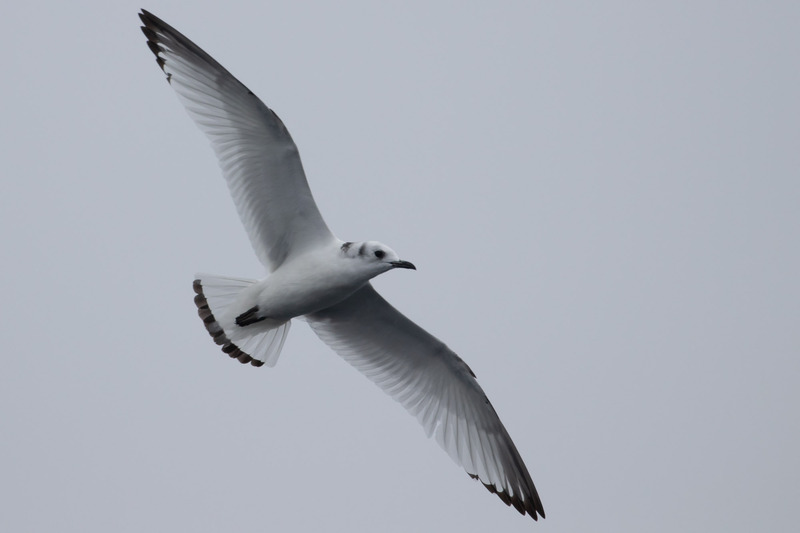 They look almost like Bonaparte’s Gulls but they have an extra black on the neck and of course black legs. 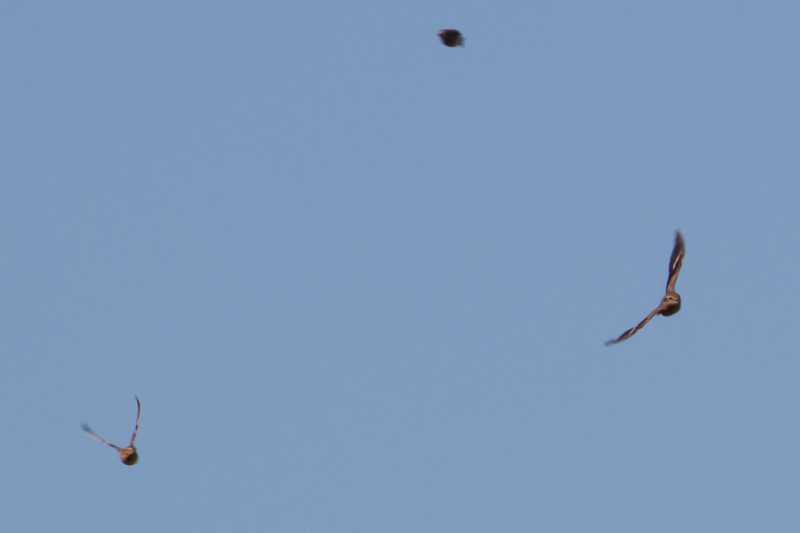 It felt good to get two birds closer to 300. 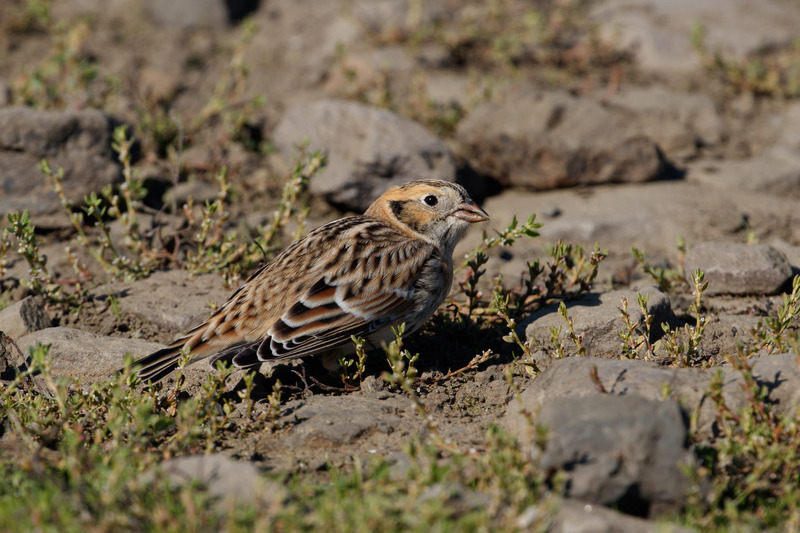 And birds that are hard if not impossible to see in Oregon on land. And did I mention I didn’t chum the waters? Success all around. I survived! With no puking! And I felt good. Good enough to enjoy myself and think about future trips. Back on land I met my dad for celebratory drinks and dinner at a quaint little Italian joint in Nye Beach called Sorella. 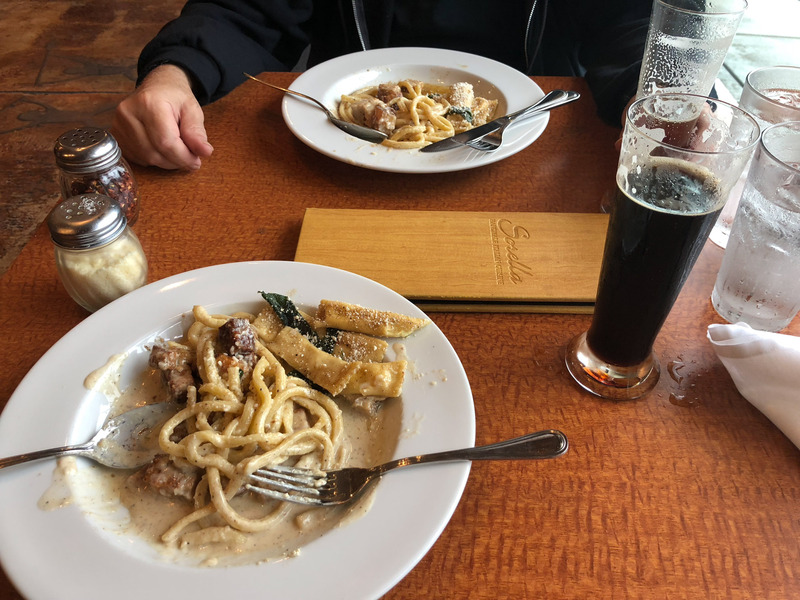 It was one of the best meals I’ve ever had. Of course food always tastes that much better after a pelagic. 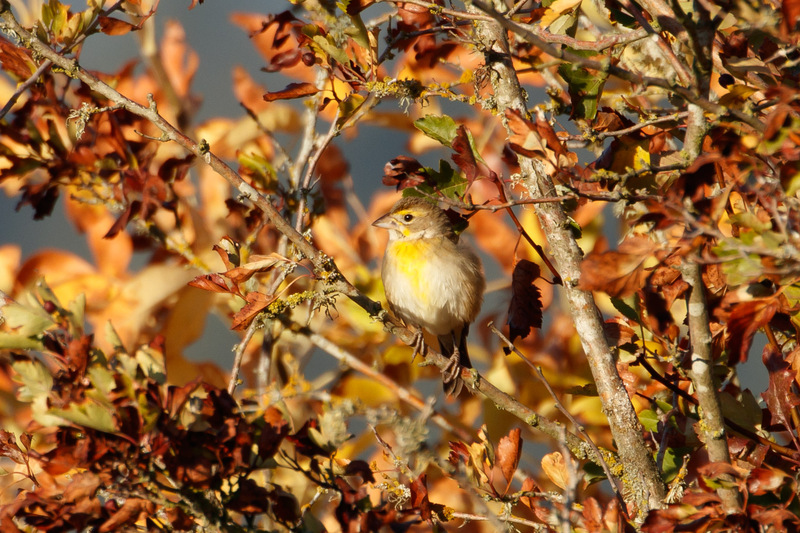 Last week my friend Sarah and I took a risk to chase a rare (to Oregon) bird called a Dickcissel. 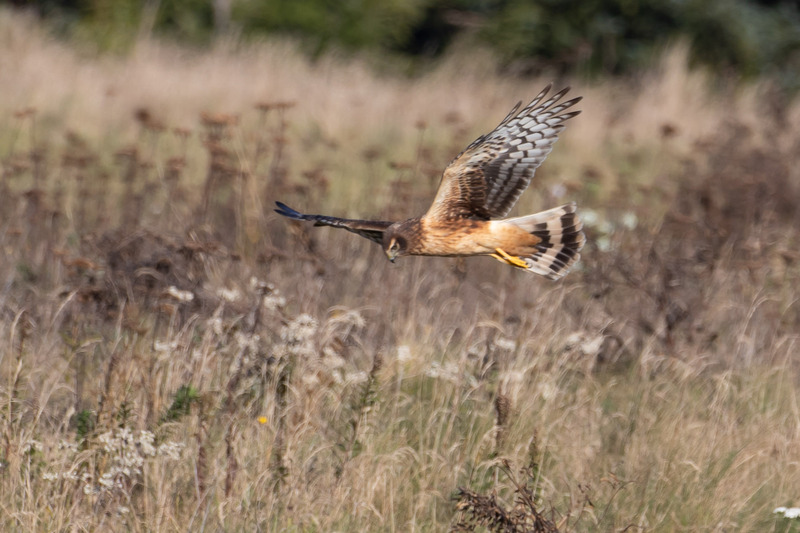 Chasing birds is inherently risky, they can fly, they can hide, they can be eaten, but this bird has an added element of risk. 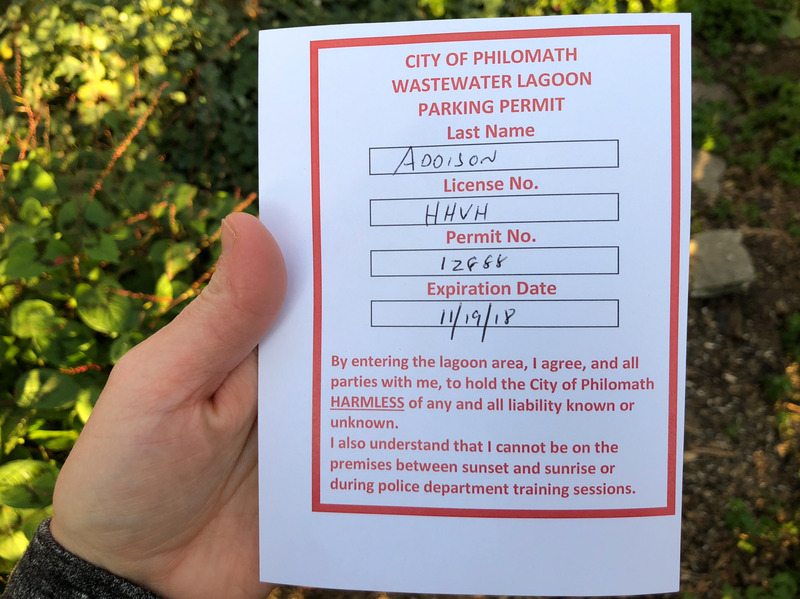 It is currently hanging around the Philomath Sewage Ponds (aka Philomath Poo Ponds aka PPP) and a permit is required for public entry. It’s relatively easy to get one, it just takes a trip to the Philomath Public Works Department during business hours (8am-4:30pm M-F). They want visitors to understand the safety rules and to avoid times when the police are target shooting nearby. Fair enough. 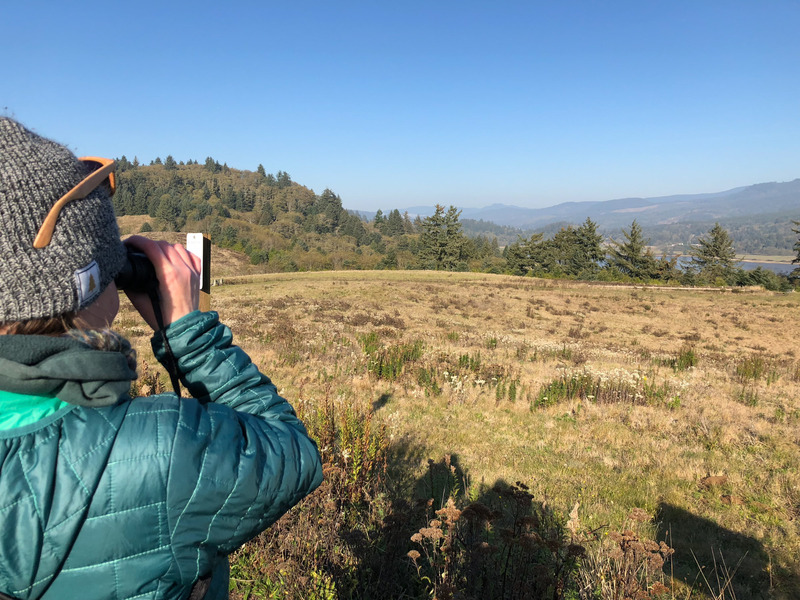 I’d been once before on a weekend before I knew about the permit process and I vowed never again without because I don’t want to be the birder who ruins it for everyone. It is a great privilege to enter the poo ponds. We left early on Friday and got to the Public Works office just after 8am. 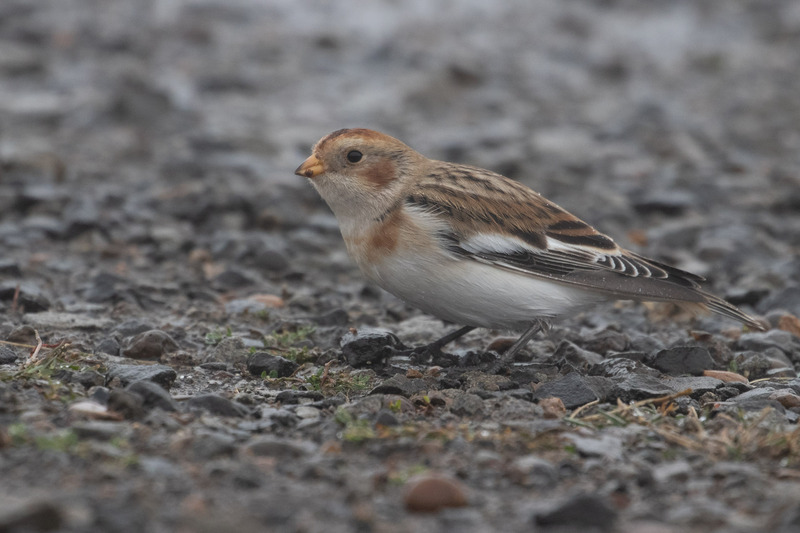 We were both worried about timing since there was only one report of the bird the day prior and it was seen at 7:25am for “5ish minutes and not seen again.” Permit in hand we pulled up to the location to see two women waving enthusiastically, it must still be here! 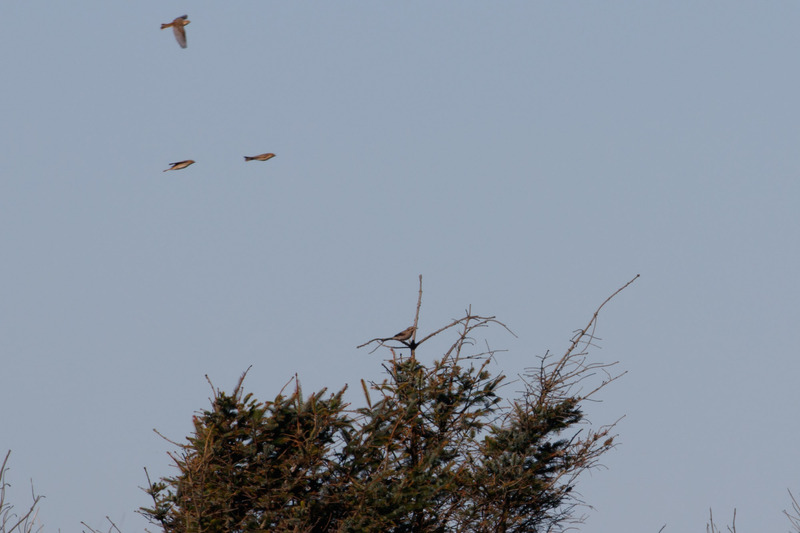 We hurried over, and they said “it was just there” flying around the tops of blackberry. We scanned intensely but didn’t see it. Had we missed the 5 minute window? Then I looked to another tree and saw it! 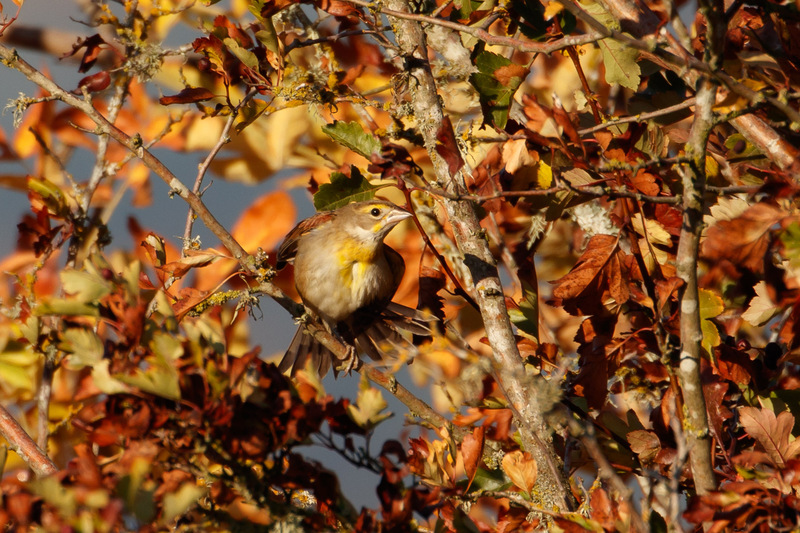 Dickcissel! 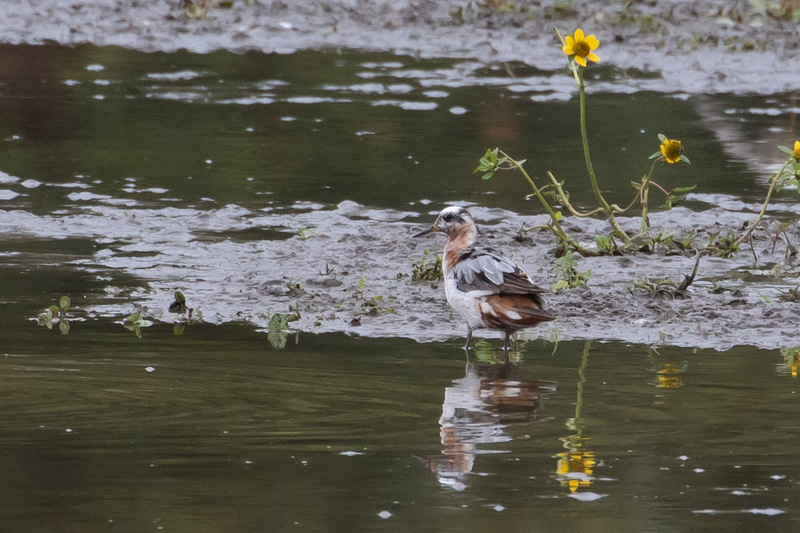 This was a lifer for me (#491) and a county bird for Sarah. 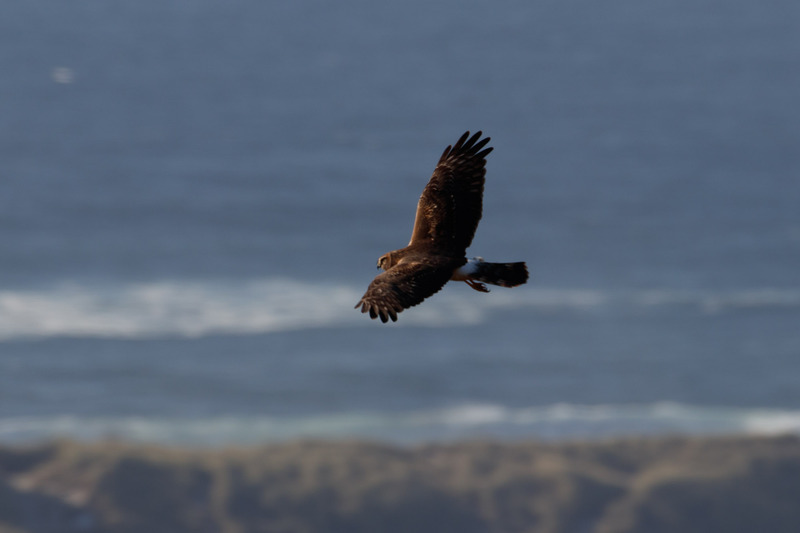 She’d seen one at Bayocean Spit near Tillamook three years ago in the pouring rain at the end of November. So this was a much nicer look. We drooled and watched it preen in good light. 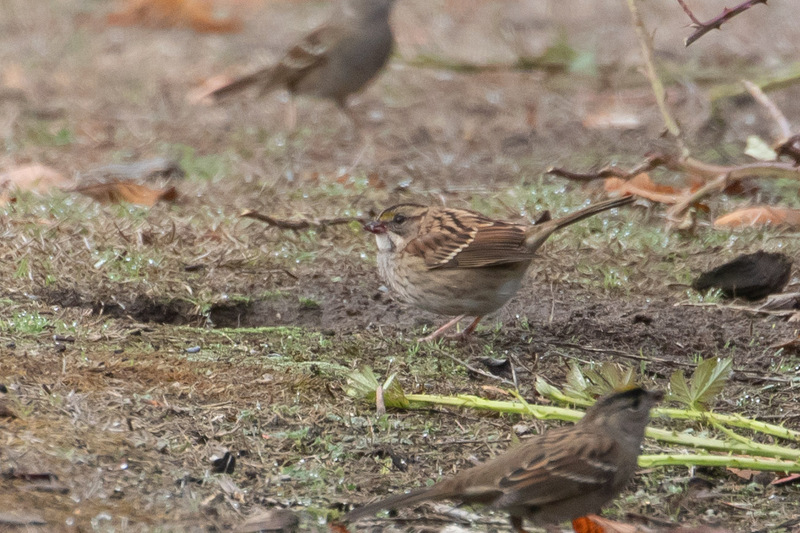 By now we could let some other birds in our sights, a White-throated Sparrow, Lincoln’s Sparrow, and a Black Phoebe that called continuously behind us. 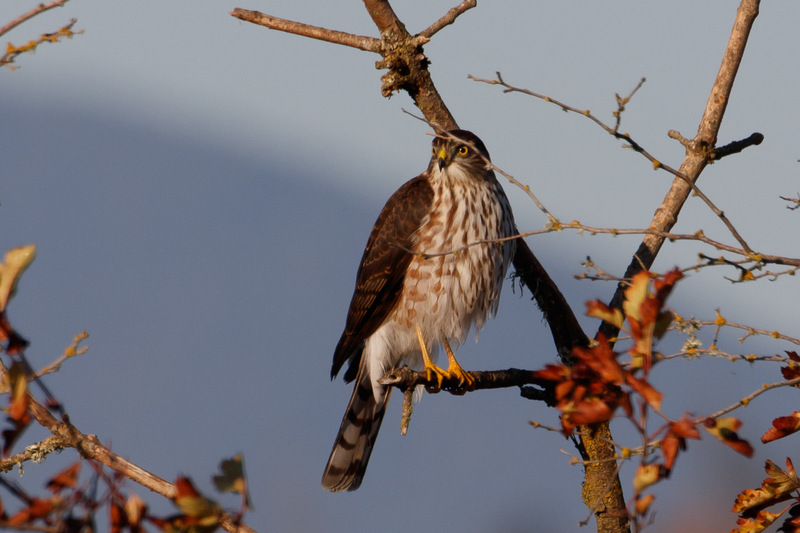 All of a sudden the birds scattered – accipiter alert! 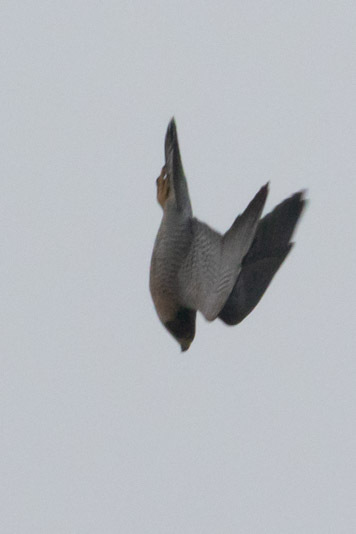 A Sharp-shinned Hawk flew in causing chaos. 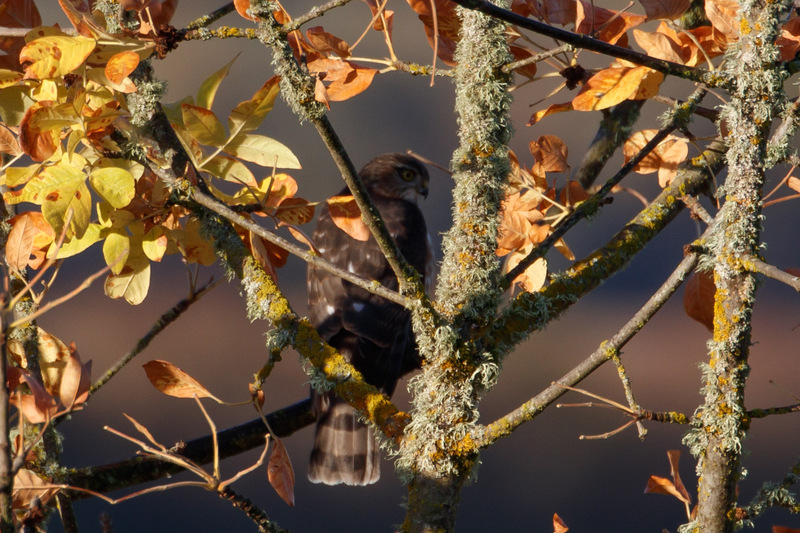 We watched until the hawk was gone and the birds were back and comfortable. Whew! It was a good time to leave and lazily count ducks on the way out. It was such a relief the chase worked out! The next plan was to drive Sarah to her parent’s house in Pacific City. 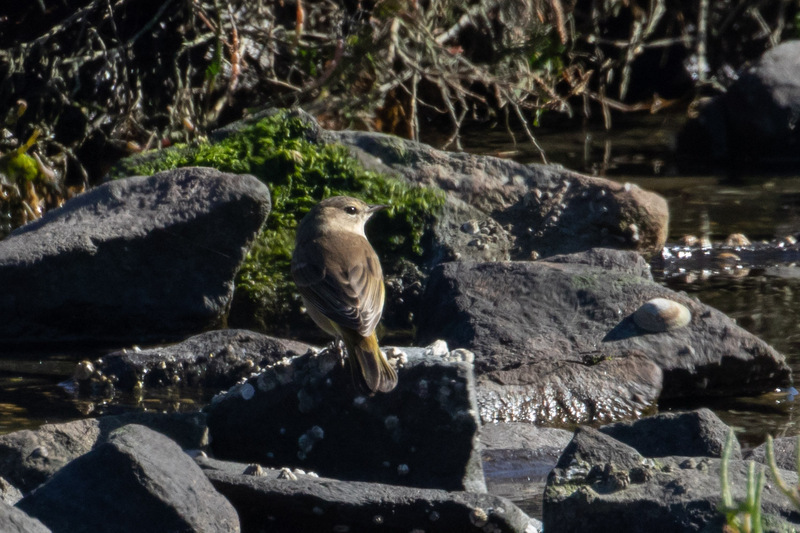 We birded along the way stopping in Newport for a chance at a Tropical Kingbird and a greater chance at Palm Warbler. We met up with my dad since he lives there now. Together we walked along the trail tripping over Yellow-rumped Warblers until Sarah spotted a Palm Warbler chased by YEWAs. 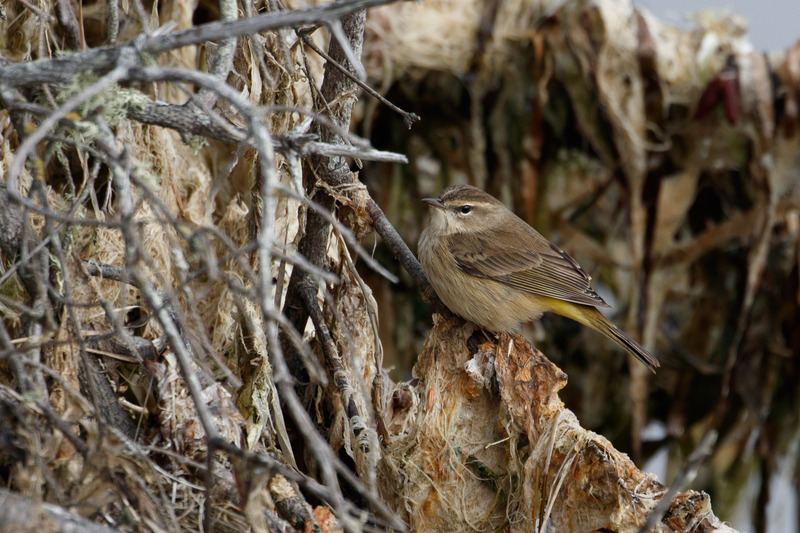 On the way back we saw a second Palm Warbler with an injured foot but it looked like it was catching bugs and feeding okay. We worked on our combo-birds on the way out. 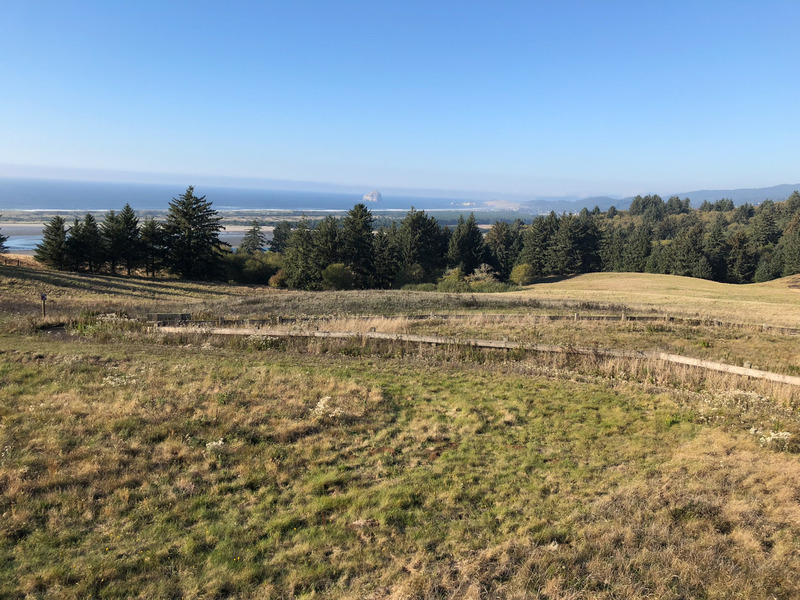 We bid my dad farewell and continued on to Nestucca Bay National Wildlife Refuge, one of six NWRs that make up the Oregon Coast National Wildlife Refuge Complex. 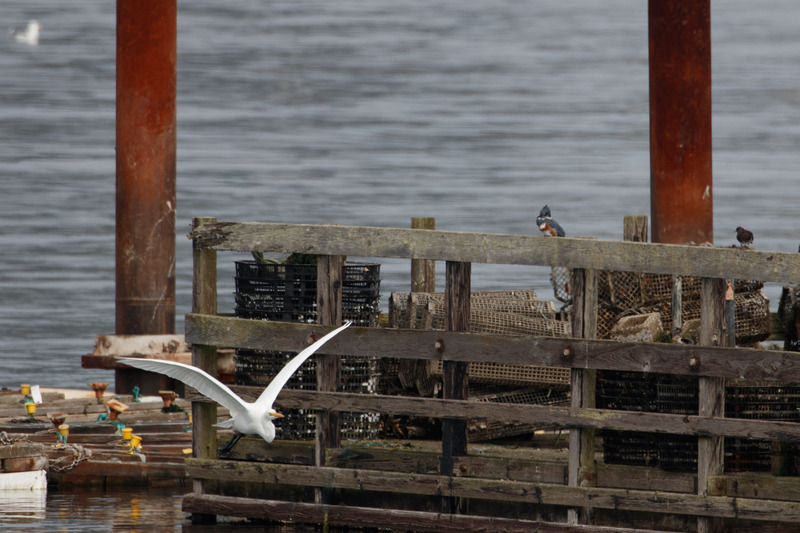 It is a sanctuary for wintering geese, including the only coastal wintering population of Dusky Canada Geese and the small population of Semidi Islands Aleutian Cackling Geese. Sad for us we saw no geese this day since it’s been so dry leaving no water in the fields. 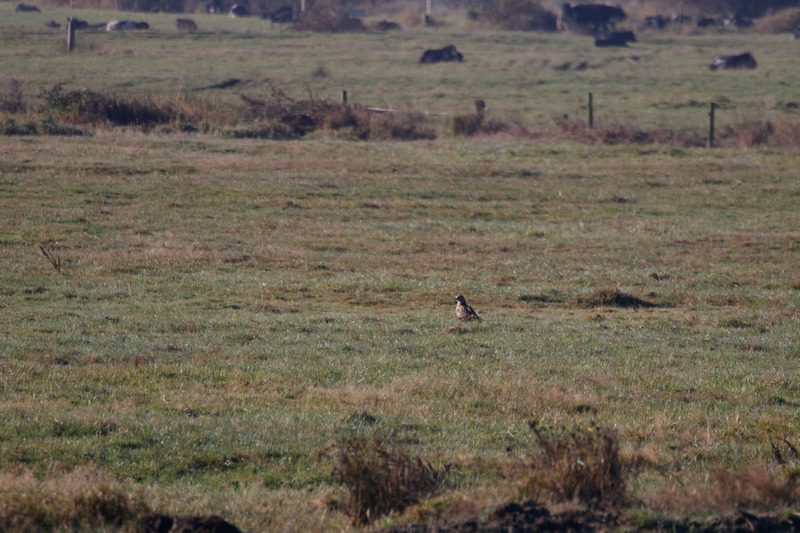 Instead we drove to the upland meadows where we found Western Meadowlark, kinglets, and a Northern Harrier hunting over the fields. It was hard to leave this magical place. 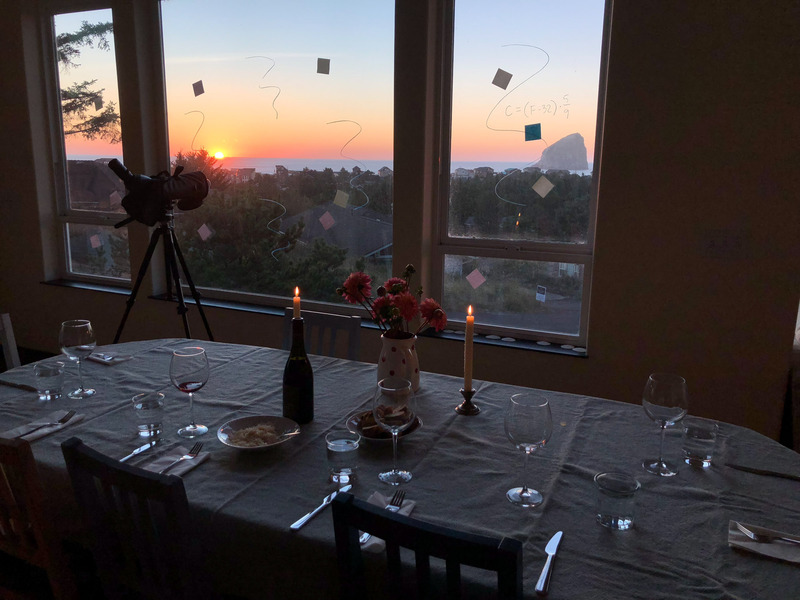 But there was a sunset and dinner waiting for us at Sarah’s parent’s house. The next morning after having homemade waffles for breakfast (because these people know how to live), Sarah and her husband Max and I explored a farm road called Old Woods Rd in hopes of a Tropical Kingbird or anything else we could find. 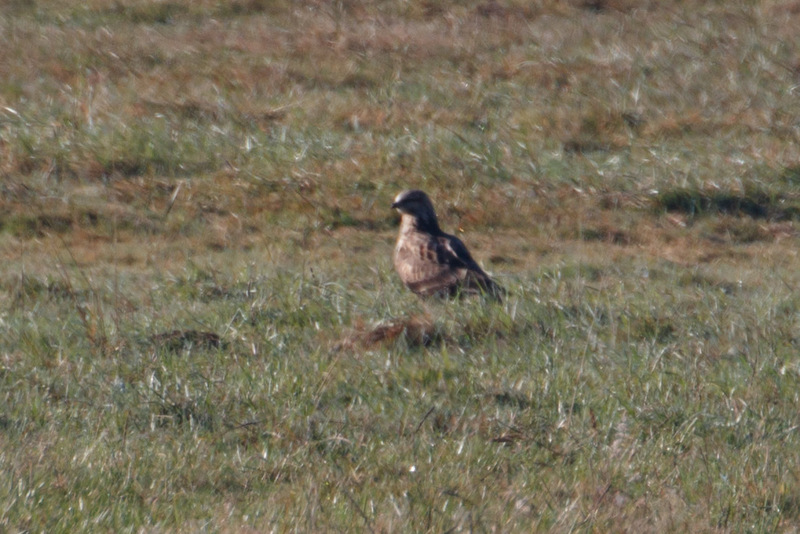 The best birds turned out to be right at the beginning, a pair of Rough-legged Hawks. 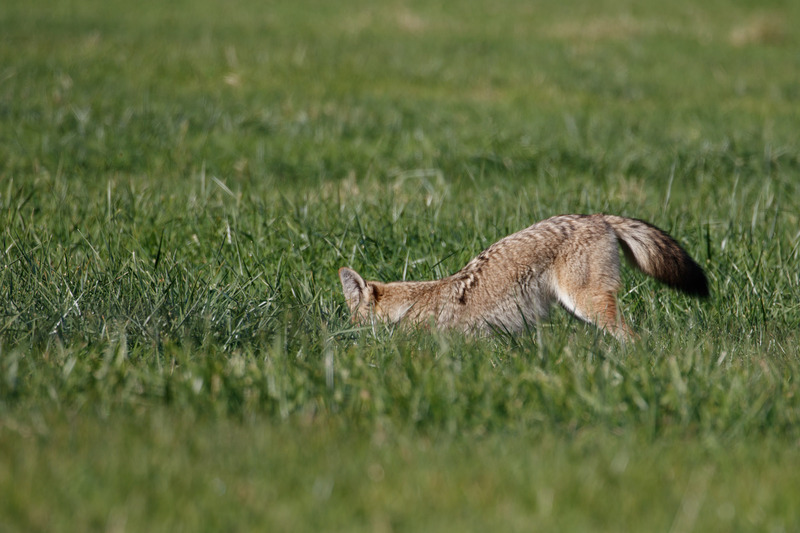 Always inspect those lumps in fields more closely. 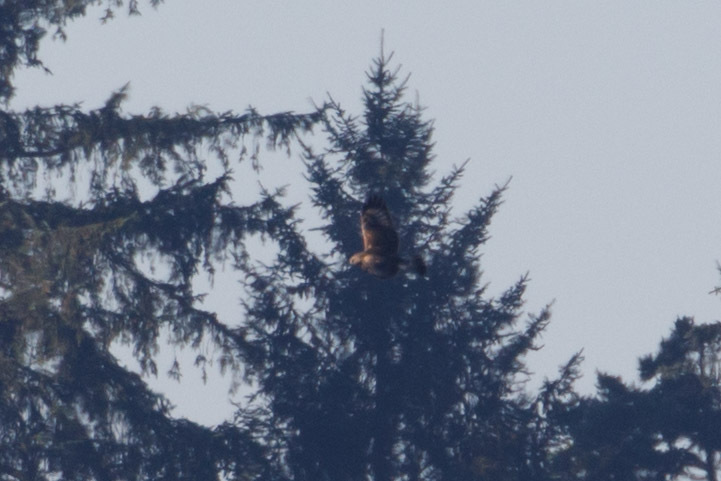 Max spotted the second bird hover-hunting in the distance across the highway. 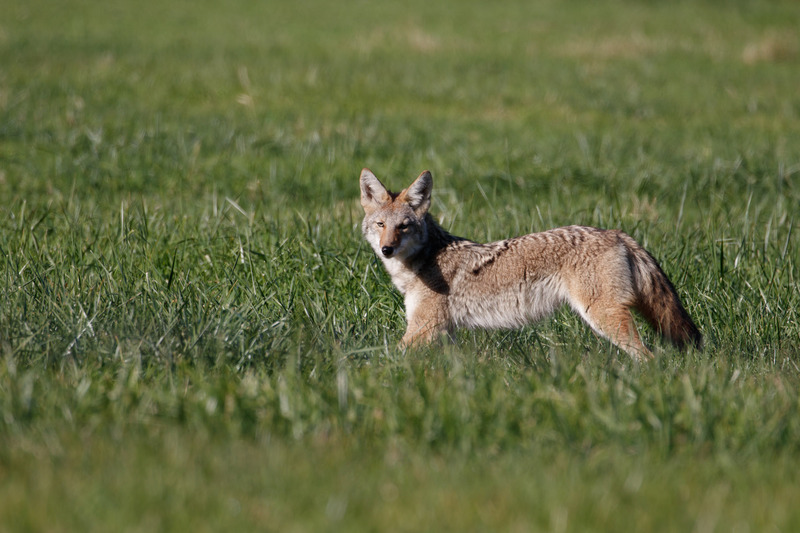 After finding the hawks and all the Black Phoebes we could, we spotted the best mammal at the end of the road, a hunting coyote! 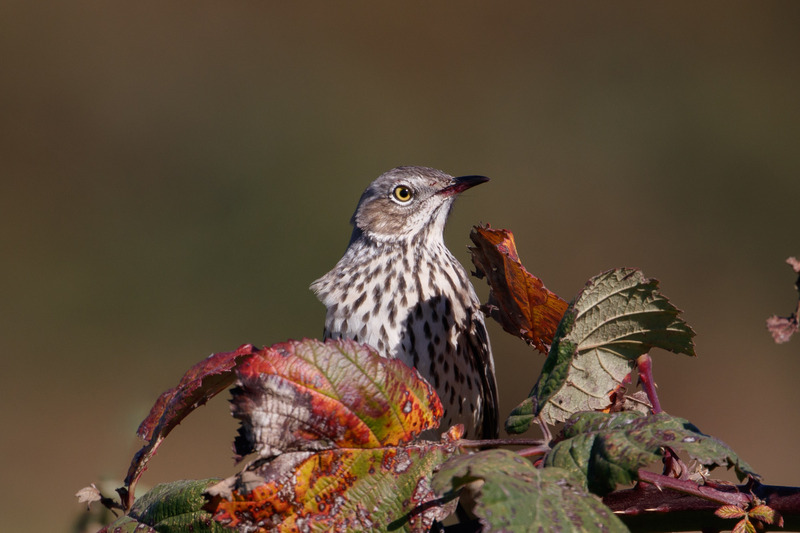 We returned to the house said our goodbyes and I continued north towards home while still looking for kingbirds (which would be state bird #297). 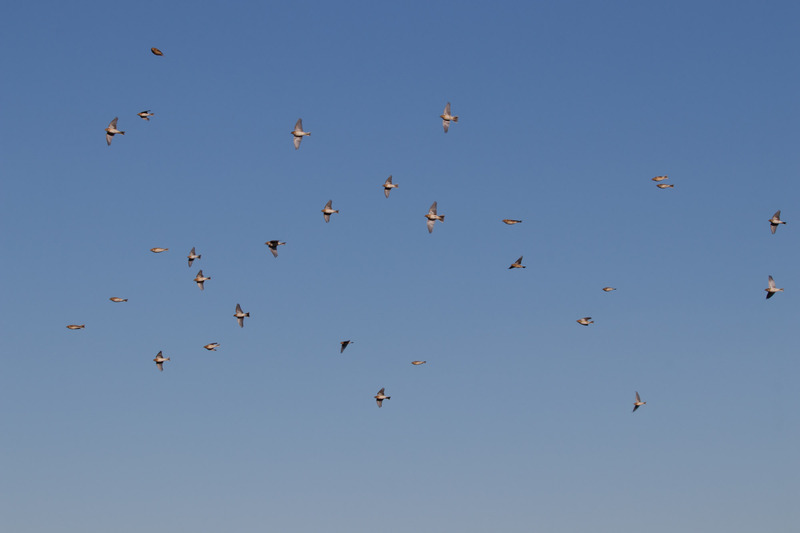 There were no OBOL reports so it was FYOB (find your own bird) day. I opted for Goodspeed Rd in Tillamook. 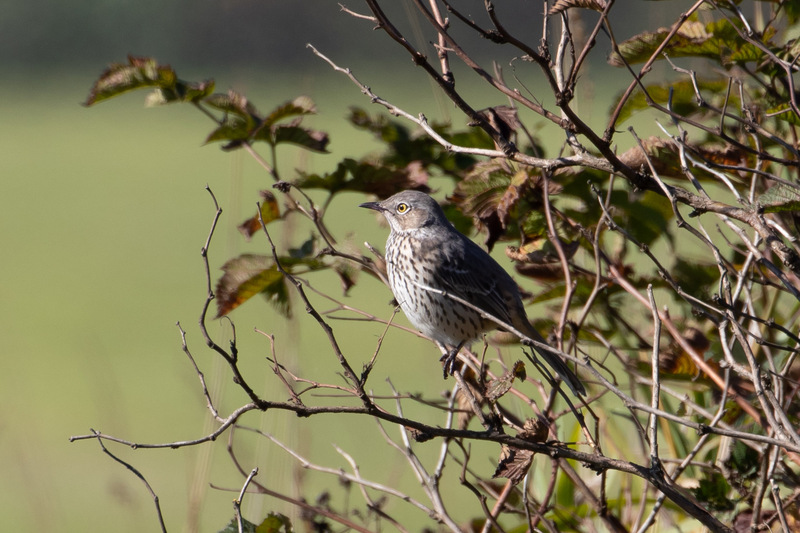 Less than a mile down the road this bird stopped me in my tracks. That shape. That face. This bird broke my brain in a really good way. 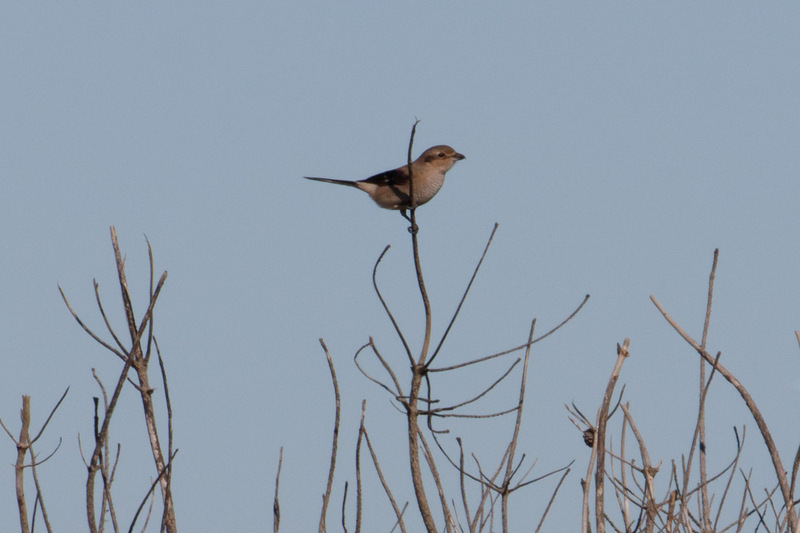 I tried to turn it into a Northern Mockingbird, which would be a somewhat unusual but expected surprise bird on the coast, but it wasn’t right. Those streaks. That bright eye. I realized this bird-out-of-context looked like a thrasher! What the what? 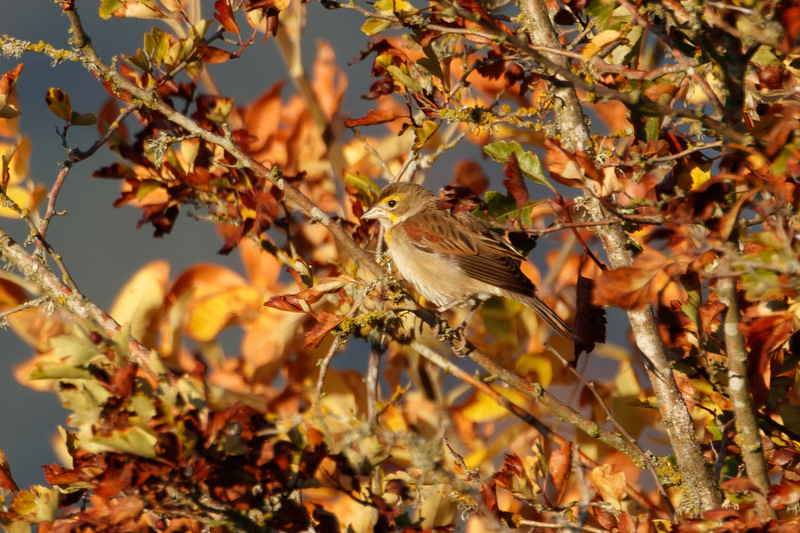 What was it doing in blackberry brambles near the coast? Thankfully, while I sat in my car scratching my head it offered excellent looks. 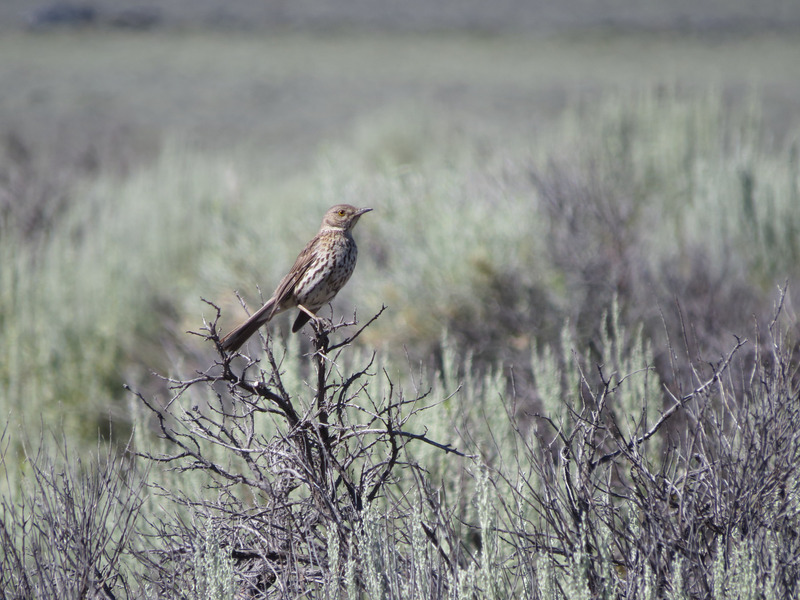 Based on location I narrowed it down to Brown Thrasher or Sage Thrasher. 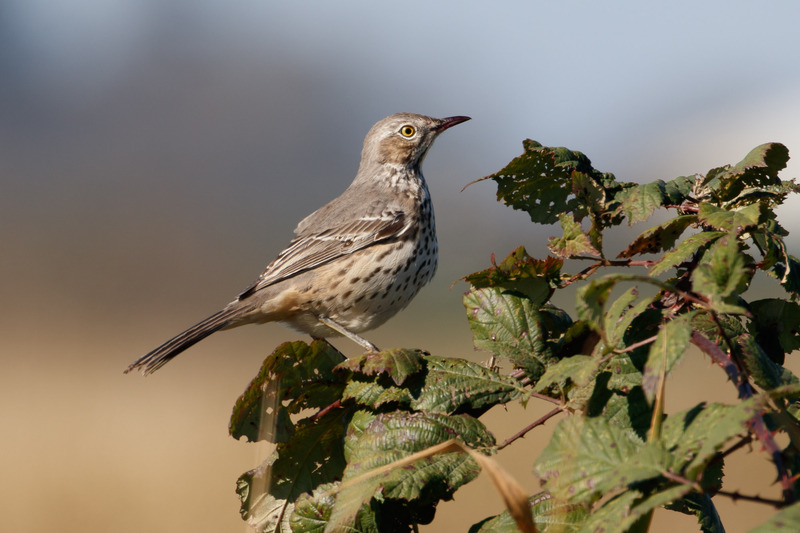 This bird wasn’t brown, and didn’t have the extended long curved bill of a Brown Thrasher. 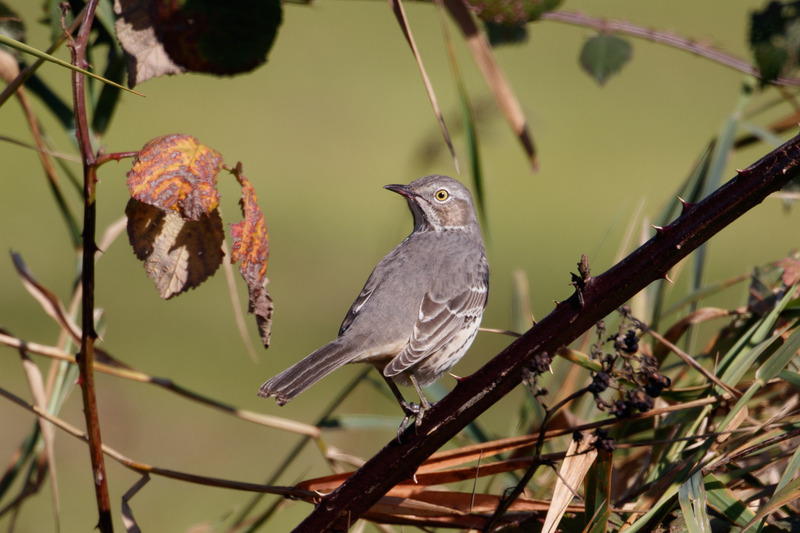 That grey back, smudged cheek, streaky breast, and pale eye, this is a Sage Thrasher! 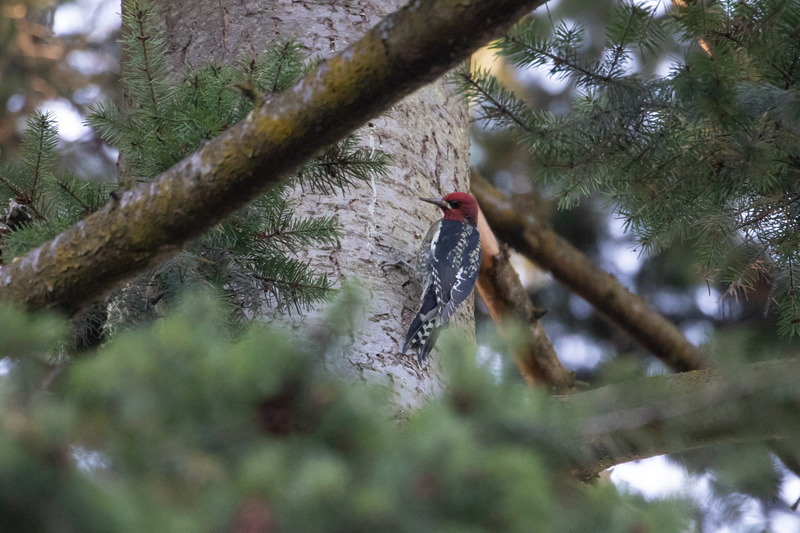 Such a fun bird to find here, and on my own no less (FMOB! 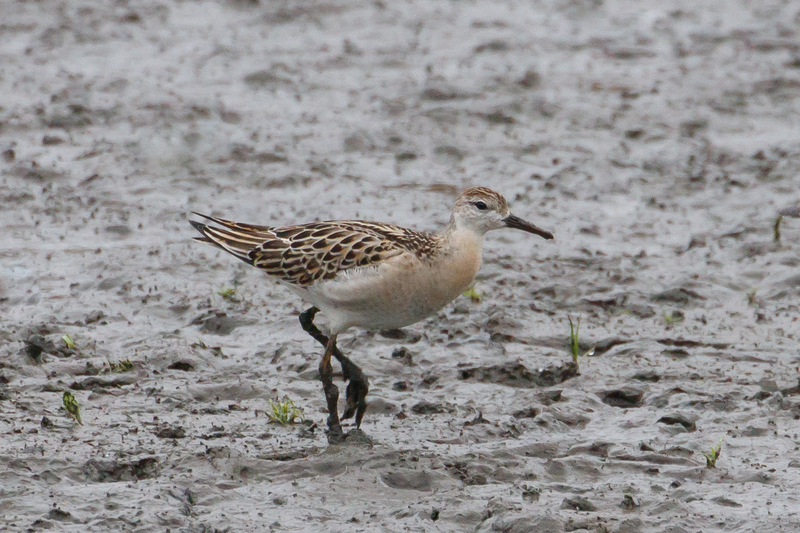 ), and according to eBird, it’s a first for Tillamook County. 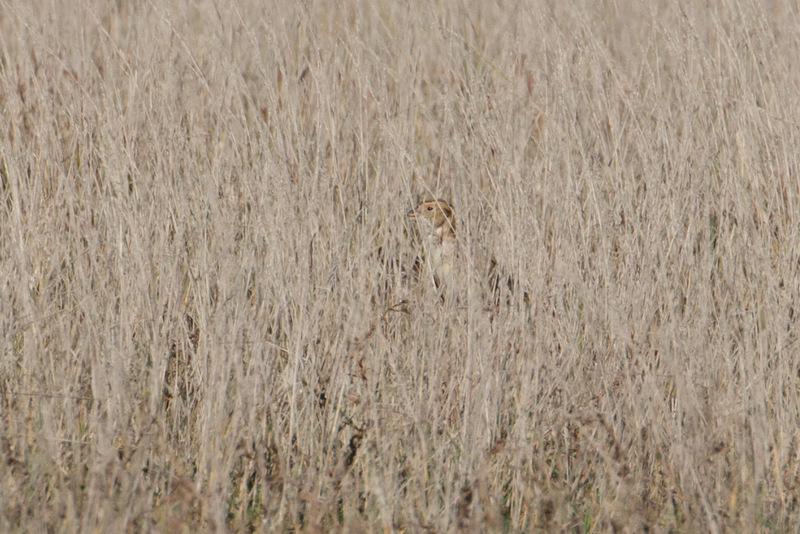 I’d seen them earlier this year east of the Cascades at Summer Lake in sage country where they’re supposed to be. 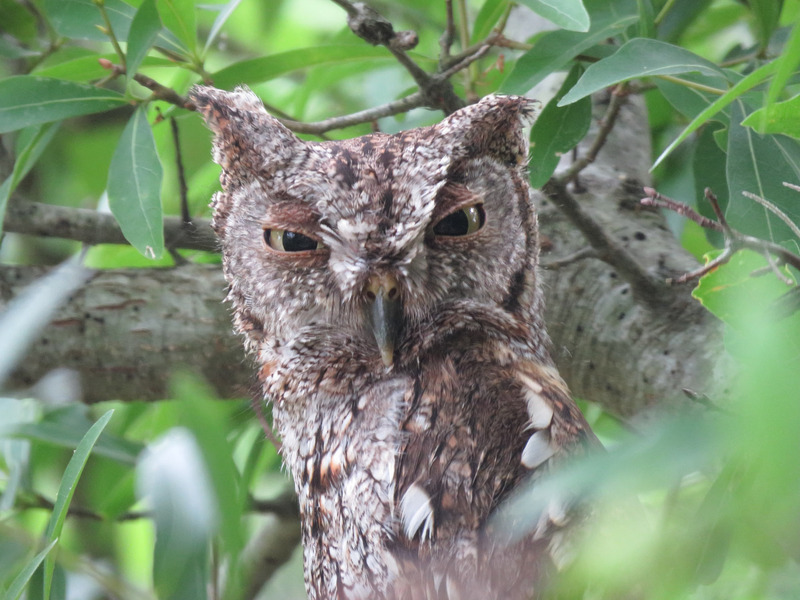 Now the search continues for a few more state year birds. My upcoming pelagic trip might help. 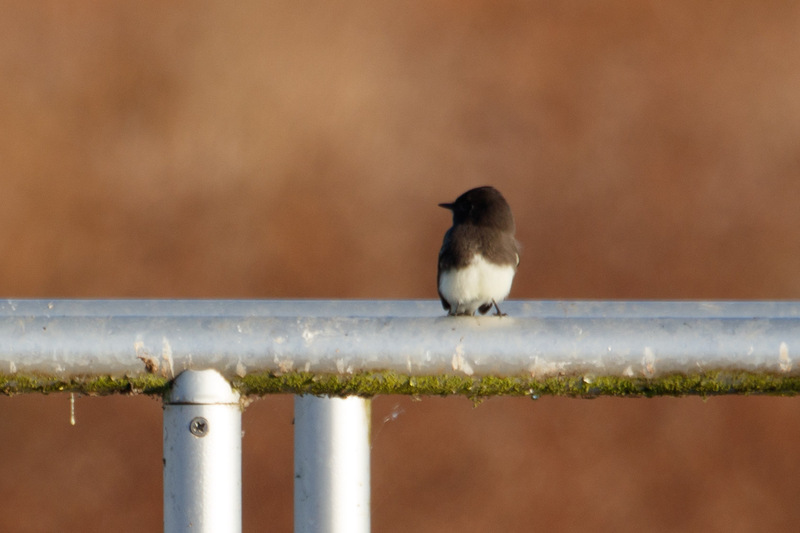 And there’s still time to find a kingbird!